The only privately-developed spacecraft to carry a pilot to suporbital space, SpaceShipOne made three successful flights in 2004. Built by aerospace visionary Burt Rutan and financed by Microsoft co-founder Paul Allen, the spacecraft won the $10 million Ansari X Prize. An evolved version, SpaceShipTwo, will serve as the foundation for Virgin Galactic's fleet of suborbital space tourism vehicles. A major turning point for private spaceflight occurred on June 21, 2004, when SpaceShipOne, the first nongovernmental crewed spacecraft, flew 62.5 miles (100 kilometers) above Earth's surface. In doing so, the vessel crossed a boundary called the Kármán line, the accepted point of entry to space as defined by the International Astronautical Federation. After two more flights in 2004, one on Sept. 29 and another on Oct. 4, the piloted vehicle won the $10 million Ansari X Prize for repeated flights in a privately developed, reusable spacecraft. SpaceShipOne was a space plane designed and fabricated by Scaled Composites, a company owned by aerospace designer Burt Rutan. The ship's development was backed by the deep pockets of billionaire Microsoft co-founder Paul Allen in a joint venture named Tier One, whose objective was to develop technology for low-cost routine access to space. 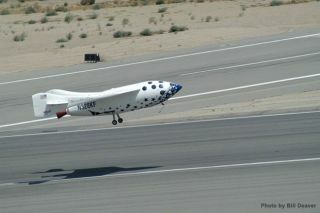 SpaceShipOne was 28 feet (8.5 meters) long. The cigar-shaped fuselage was about 5 feet (1.5 m) in diameter and could carry a pilot and up to two passengers. The plane had short, wide wings with a 16-foot (5 m) span. Large, vertical tail booms were mounted on the end of each wing. During re-entry, the rear half of the wings folded upward, increasing drag while maintaining stability; then, the wings were moved back into gliding position for landing. The spacecraft was launched in midair, at an altitude of about 50,000 feet (15,000 m), from the underside of its mothership, White Knight, a turbofan-powered airplane. After SpaceShipOne glided for a few seconds, hybrid rocket motors on it fired for 80 seconds to loft the craft just beyond the atmosphere. SpaceShipOne arced through space for about 3 minutes and then glided back to Earth without making a complete orbit around the planet, otherwise known as a suborbital flight. SpaceShipOne made 17 flights in all. Spaceflight was achieved on the 15th flight. Test pilot Michael Melvill was at the controls for that momentous trip, and he later became the first licensed commercial astronaut. On Sept. 29, 2004, Melvill flew to an altitude of 64 miles (102 km). On Oct. 4, 2004, pilot Brian Binnie flew to an altitude of 70 miles (112 km). SpaceShipTwo is designed to fly two pilots and six passengers on short, suborbital spaceflights that travel more than 62 miles (100 km) above Earth, offer a few minutes of weightlessness and then return to a runway landing. Tickets for SpaceShipTwo flights currently cost $250,000 apiece. Branson initially promised customers that Virgin Galactic would fly them into space by 2007, but the company has yet to do so and has not offered a new date. During many years of development, the SpaceShipTwo team encountered issues such as development delays, a fatal ground explosion in 2007 and a fatal crash of VSS Enterprise during a test flight in 2014. However, SpaceShipTwo prototypes have successfully executed a number of powered flights (which means using the engine’s propulsion, as opposed to gliding). On Dec. 13, 2018, the VSS Unity test vehicle reached an altitude of 51.4 miles (82.7 km). That's a little higher than the boundary of space, as defined by the U.S. Air Force, but still below the Kármán line. Check out photos of Virgin Galactic's test flights over the past few years. Read more about the SpaceShipOne exhibit at the Smithsonian National Air and Space Museum. Watch this video about the team that created SpaceShipOne, from the Smithsonian National Air and Space Museum. This article was updated on March 5, 2019 by Space.com contributor Elizabeth Howell.